Toll-like receptors (TLR) and related downstream signaling pathways of innate immunity have been implicated in the pathogenesis of Plasmodium falciparum malaria. Because of their potential role in malaria pathogenesis, polymorphisms in these genes may be under selective pressure in populations where this infectious disease is endemic. A post-PCR Ligation Detection Reaction-Fluorescent Microsphere Assay (LDR-FMA) was developed to determine the frequencies of TLR2, TLR4, TLR9, MyD88-Adaptor Like Protein (MAL) single nucleotide polymorphisms (SNPs), and TLR2 length polymorphisms in 170 residents of two regions of Kenya where malaria transmission is stable and high (holoendemic) or episodic and low, 346 residents of a malaria holoendemic region of Papua New Guinea, and 261 residents of North America of self-identified ethnicity. The difference in historical malaria exposure between the two Kenyan sites has significantly increased the frequency of malaria protective alleles glucose-6-phoshpate dehydrogenase (G6PD) and Hemoglobin S (HbS) in the holoendemic site compared to the episodic transmission site. However, this study detected no such difference in the TLR2, TLR4, TLR9, and MAL allele frequencies between the two study sites. All polymorphisms were in Hardy Weinberg Equilibrium in the Kenyan and Papua New Guinean populations. TLR9 SNPs and length polymorphisms within the TLR2 5' untranslated region were the only mutant alleles present at a frequency greater than 10% in all populations. Every year 350–500 million cases of malaria occur worldwide, and up to 2.5 million of these individuals are estimated to die, mainly from neurologic complications, severe anaemia or respiratory distress due to Plasmodium falciparum . The burden of malaria mortality now and in recent human evolutionary history has been greatest in children under the age of five years, consistent with the notion that malaria has had a powerful effect on selection of the human genome. Indeed, based on observations of the geographic overlap between malaria endemicity and the frequency of erythroid variants such as thalassaemia, Haldane hypothesized in the mid 20th century that such polymorphisms were under selective pressure, because they were protective against severe malaria infection and thereby increased the reproductive fitness of individuals living in malaria endemic areas [2, 3]. Toll-like receptors are innate immune receptors that bind to conserved structural motifs expressed by microbial pathogens. TLR2, TLR4, TLR9, and downstream signaling pathways of these proteins have recently been implicated in human malaria pathogenesis [4–6]. TLR2 is expressed on the cell surface, where it is activated by bacterial lipopeptides and fungal and Mycoplasma ligands [7–9]. Malaria-derived glycosylphosphatidylinositol (GPI) has been identified as a potential malaria "toxin" by activating TLR2 signaling . The TLR2 gene is located on chromosome 4q32 and is comprised of 3 exons, which encode 784 amino acids [10, 11]. A 22 bp insertion/deletion polymorphism (TLR2 Δ22) in the first untranslated exon was observed to be highly polymorphic in a Japanese population but was not associated with a disease phenotype . A GT dinucleotide that varies by approximately 12 to 30 repeats (GTn) is present within the second intron, approximately 100 bp upstream of the translational start site. Repeats of varying length have been associated with susceptibility to tuberculosis, reversal reactions in leprosy, and colorectal cancer [13–15]. Shorter repeats are associated with reduced TLR2 reporter activity and TLR2 surface expression in vitro . A non-synonymous SNP in the third exon of TLR2, Arg753Gln, is associated with susceptibility to tuberculosis , and presumably because of its location in the intracellular domain, abolishes downstream signaling in vitro . TLR4 is expressed on the cell surface and is activated by bacterial lipopolysaccharide [18, 19]. Plasmodium falciparum GPI may weakly activate TLR4 . The gene is on chromosome 9q32-q33, consists of 4 exons, and spans approximately 19 kb [10, 20]. Two non-synonymous TLR4 SNPs (Asp299Gly and Thr399Ile) are in the extracellular domain, and commonly co-segregate in European Caucasian but not in African populations [21, 22]. These SNPs have been associated with various infectious and inflammatory diseases (reviewed in ). Ghanaian children with the Asp299Gly and Thr399Ile alleles had an increased risk of severe malaria . These TLR4 mutations confer a hyporesponsive phenotype in vitro in some studies,  but not in others [22, 24]. TLR9 is expressed in endosomal compartments, where it binds to and is activated by bacterial DNA with unmethylated CpG motifs [25, 26]. Malaria haemozoin and/or parasite DNA have been identified as potential TLR9 ligands [27, 28]. TLR9 spans 5 kb on chromosome 3p21.3, consists of 2 exons, and encodes 1028 amino acids . Three TLR9 SNPs are present at approximately 15% or greater allele frequency in North American populations . Two of these SNPs, -1486T/C and -1237T/C, are located within the promoter; 1174G/A is in the intron. TLR9 -1237 T/C has been associated with susceptibility to Crohn's Disease, atopic eczema, and asthma [31–33]. Both TLR4 Asp299Gly and TLR9 -1486T/C were associated with low birth weight and maternal anaemia in a malaria endemic population . MAL (also known as Toll-Interleukin-1 Receptor domain-containing Adaptor Protein, TIRAP) is a downstream adaptor protein common to both the TLR2 and TLR4 signaling pathways [35, 36]. The gene spans 14.5 kb on chromosome 11q24.2, consists of 8 exons, and encodes a 221 amino acid protein. Individuals heterozygous for a Ser/Leu mutation at amino acid 180 were reported to be protected from invasive pneumococcal disease, bacteraemia, malaria, and tuberculosis in an analysis of several case-control studies conducted in the UK and sub-Saharan Africa . A subsequent study found protection against tuberculosis in a population of Colombians , but no protection was revealed in an analysis comparing tuberculosis cases and controls from Russia, Ghana, and Indonesia . The Ser to Leu amino acid change abolishes the ability of TLR2 to recruit MAL for downstream signaling in vitro . The hypothesis of this study was that the above TLR and MAL genes are under selective pressure by malaria and therefore, that the frequencies of the SNPs observed in these genes would vary significantly among populations historically and currently exposed to differing levels of malaria transmission and morbidity. For example, in the two Kenyan study sites examined here, the frequencies of sickle cell trait and G6PD deficiency are significantly greater in the holoendemic site compared to the episodic transmission site , where malaria transmission was introduced during the first half of the 20th century [40, 41]. To test this hypothesis, residents living in areas of varying malaria endemicity in sub-Saharan Africa and Papua New Guinea were genotyped for TLR2, 4, 9, and MAL polymorphisms. Furthermore, in order to put these data in the context of innate immune polymorphisms of populations with no recent history of malaria exposure, North Americans of self-identified ethnicity were also analyzed. TLR and MAL genetic polymorphisms were evaluated in 170 individuals from Kenya, 346 individuals from Papua New Guinea, and 261 North Americans of self identified ethnicity (total n = 777). Kenyan and Papua New Guinean study population characteristics in terms of age structure and malaria infection prevalence are presented in additional file 1 (table S1). The samples from Kenyans were collected from residents of two villages in the western part of the country, Kanyawegi (n = 91) and Kipsamoite (n = 79), as part of an earlier immunoepidemiologic study . All study participants were asymptomatic with no malaria-related illness when blood for genotyping was obtained. Malaria transmission in the lowland area of Kanyawegi is holoendemic. Annual entomologic inoculation rates may exceed 300 infectious bites per person . Kipsamoite is located in a highland area in the Nandi district of Rift Valley Province where malaria transmission is unstable and characterized by periods with extremely low malaria infection prevalence . During the course of this study, uncomplicated malaria cases peaked in Nandi during the months of May to August, during which time approximately 200 cases were reported by the Kipsamoite Health Center . The 346 Papua New Guinean DNA samples were collected from people of the Urat and Urim linguistic groups in the Dreikikir district of East Sepik Province. These individuals were enrolled in a study examining mass drug administration to eliminate filariasis. During the course of the study, infection rates with various Plasmodium spp. and P. falciparum asexual densities were obtained. All individuals were asymptomatic with no known episodes of severe malaria morbidity. Malaria transmission is perennial and stable in this area of Papua New Guinea. The entomologic inoculation rate is estimated to be 0.9 infectious bites per person per night, a transmission intensity similar to the holoendemic Kenya site . Mild malaria in this area has a peak prevalence in children less than 5 years old, and severe malaria is most frequently manifested as severe anaemia. DNA from de-identified North American adults was obtained from the National Histocompatibility Laboratory, American Red Cross/University of Maryland Medical System, Baltimore, MD. Race and ethnicity of the North Americans were self-identified. The population was heterogeneous – Asian American (n = 84), Caucasian American of European ancestry (n = 84), and African American (n = 93). Informed consent, blood sample collection, and genotyping were performed under protocols approved by the Ethical and Institutional Review Boards for Human Investigation at the Kenya Medical Research Institute, the Medical Research Advisory Committee of the Papua New Guinea Department of Health, and University Hospitals of Cleveland/Case Western Reserve University. PCR amplification products from local donors were purified using the QIAquick PCR purification kit (QIAGEN, Valencia, CA). Purified PCR products were sent to MWG Biotech, High Point, NC for sequencing. Sequences were analyzed using the Sequencher software (Gene Codes Corporation, Ann Arbor, MI). Sequenced DNA templates were subjected to PCR and used in the LDR-FMA as positive controls. PCR products were analyzed in a LDR-FMA divided into 3 steps: (1) ligation of oligonucleotides to the SNP, (2) FlexMAP microsphere hybridization, and (3) detection using the Bioplex suspension array system, which includes a fluorescence reader and the Bio-Plex Manager analytical software (Bio-Rad Laboratories, Hercules, CA). This procedure is described in detail elsewhere . Conserved and allele-specific probe sequences are listed in additional file 3 (table S3). A multiplex assay was used for simultaneous detection of TLR2, TLR9, and MAL SNPs. TLR4 SNPs were evaluated in a separate multiplexed LDR. Equal volumes of each PCR product were mixed, and 1 μl was added to the LDR. Conditions for the LDR step of this assay are described elsewhere . Mean Fluorescence Intensity (MFI) values were used to calculate the allelic ratio for each SNP by dividing the allele-specific MFI value by the sum of the MFI values for that SNP (allele A/A+B = An, and allele B/A+B = Bn), where A and B are the 2 alleles of a SNP. To be homozygous for a particular allele, the ratio must be > 0.75. To be heterozygous, the ratio of the 2 alleles must be between 0.25 and 0.75. Consequently, an allele included in a ratio of < 0.25 is considered not present. Normalized values for An and Bn were divided, and the quotient was log-transformed. The mean and 95% confidence interval (CI) of the log-transformed quotients for the 777 individuals genotyped in this study are presented in additional file 4 (table S4). Allele (or haplotype) and genotype (diplotype) frequencies were calculated for the different polymorphisms, the Hardy-Weinberg exact test (estimation of p-values by the Markov chain method), and the Ewens-Watterson homozygosity test was performed for each population using Arlequin version 3.01 http://cmpg.unibe.ch/software/arlequin3. Differences in allele frequencies among study groups were determined by chi-square analysis using SPSS for Windows (version 13.0). A p-value < 0.05 was considered to be significant. Statistical comparisons of allele frequencies were made between the following groups; Kenya malaria holoendemic vs. Kenya episodic transmission: each of the Kenyan study populations vs. African American, Kenya holoendemic vs. Papua New Guinea holoendemic, and Papua New Guinea holoendemic vs. Asian Americans. Linkage disequilibrium analysis was performed using SHEsis . Table 1 describes the mutant allele frequencies for the TLR2, TLR4, TLR9, and MAL SNPs, TLR2 Δ22, and TLR2 GTn polymorphisms in the populations from Kenya, Papua New Guinea, and North America. GTS < 16 repeats, GTM 16–23 repeats, GTL > 23 repeats. The TLR2 Δ22 polymorphism in the 5' untranslated region was present in all populations examined at an allele frequency >10%. The lowest value was in Papua New Guineans (13.1%), compared with 32.6% for the Kenyan episodic transmission site. Although the holoendemic Kenyan and Papua New Guinea sites have similar malaria transmission intensities, this allele was significantly less common in Papua New Guinea compared to the Kenya holoendemic site (p < 0.001). Allele frequencies were similar for Kenyan study participants from the holoendemic and episodic transmission sites. The GTn repeat in the 5' untranslated region of TLR2 was highly polymorphic in all populations examined. Consistent with how this genetic variation has been analyzed previously [13, 49], the alleles were classified as short (<16), medium (16–23), and long (>23) repeats. The distribution of the length of the repeat is displayed in Figure 1, and frequencies of the allele are presented in Table 1. The medium length allele accounted for >50% of total alleles in all populations with the exception of Asian Americans, where it was 39.4%. Frequency of GT repeat polymorphism (GTn) among residents of malaria endemic and malaria non-endemic areas. A previous report showed that the TLR2 SNP Arg753Gln is absent in Urat and Urim speakers from Papua New Guinea . Therefore, this SNP was not tested here. Arg753Gln was also absent in Kenyans but present in North Americans, consistent with previous reports . The two TLR4 SNPs examined in this study are absent in the Urat and Urim linguistic groups in Papua New Guinea  and therefore, were not tested here. The predicted Asp299Gly and Thr399Ile amino acid mutations were present at frequencies that were not statistically different for the Kenyans residing in the malaria holoendemic and episodic transmission areas (range 0.7–7.1%). With the exception of -1237C in Papua New Guineans and Asian Americans, all TLR9 SNPs were present at a frequency greater than 10%. Both -1486T/C and 1174G/A were more common in Papua New Guinea compared to the Kenya holoendemic site (p = 0.026 and p < 0.001, respectively). There were no significant differences in TLR9 SNP frequencies associated with different malaria exposures in Kenya. The MAL 180 mutant allele was most common in Papua New Guineans (14.9%). In contrast, this allele was completely absent in the holoendemic Kenyan transmission site, and present in only 2.5% in the episodic transmission site. Table 2 shows the genotype frequencies for TLR2 Δ22, TLR4, TLR9, and the MAL polymorphisms. All three TLR2 Δ22 genotypes were found in all populations, and were in Hardy-Weinberg equilibrium. The TLR4, TLR9, and MAL SNPs were in Hardy-Weinberg equilibrium in both Kenya and Papua New Guinea. In contrast to Papua New Guineans where -1237C was absent, this allele was present in Asian Americans, for whom there were fewer heterozygotes than expected (p = 0.022). The MAL genotypes were in Hardy-Weinberg equilibrium in all populations except in African Americans, where there was a deficit of heterozygosity (p = 0.02). Statistically inferred haplotypes for TLR2, TLR4, and TLR9 are described in Table 3. Of six possible TLR2 haplotype combinations, all were present in Papua New Guineans and North Americans. The deletion allele did not co-segregate with any of the GT repeat length alleles, as determined in linkage disequilibrium analysis where two polymorphisms were considered in linkage disequilibrium if the values for D' and r2 were >0.9 (data not shown). The Asp299Gly and Thr399Ile SNPs in the TLR4 gene commonly co-segregated in Caucasian Americans. Consistent with these data, the two polymorphisms were in linkage disequilibrium as measured by D' and r2 (data not shown). 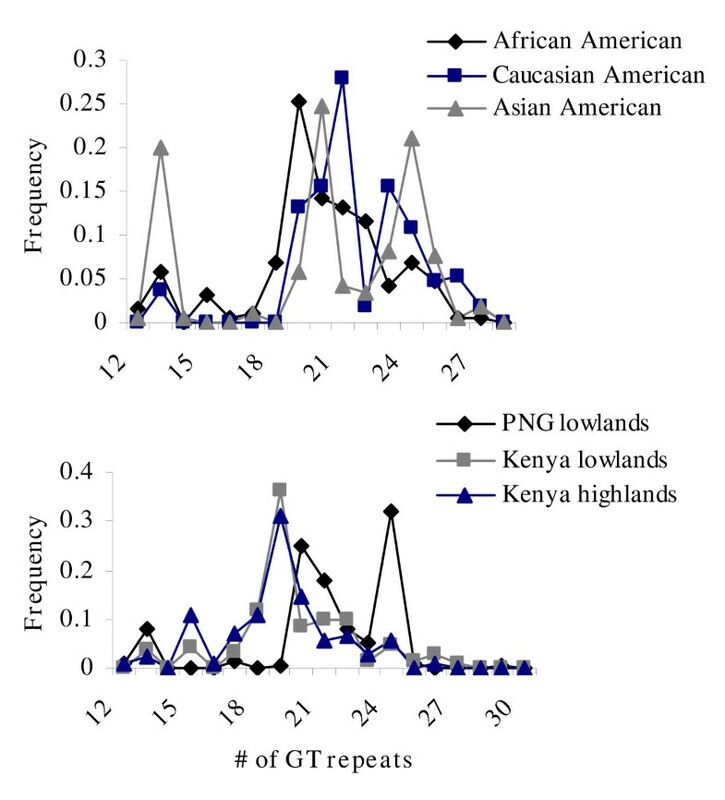 In Kenya, the TLR4 mutations co-segregated less frequently, and the Gly-Thr haplotype was present at 5–6% frequency in both the episodic transmission and holoendemic study sites. This haplotype was also found in African Americans and Asian Americans. There was no linkage disequilibrium between Asp299Gly and Thr399Ile in the Kenyans, African Americans, or Asians Americans (data not shown). The most common TLR9 haplotypes were CTG and TTA, except in Kenyans and African Americans, where TCG and TTA were the most common. There were fewer TLR9 haplotypes present in Papua New Guineans compared to the other populations, largely due to the absence of the -1237 allele. There was linkage disequilibrium between all TLR9 SNP pairs present in Papua New Guineans (data not shown). This linkage disequilibrium was absent in the Kenyan and Asian American populations. S < 16 repeats, M 16–23 repeats, L > 23 repeats. IIIFirst nucleotide is -1486, second is -1237, and third is 1174. There is compelling evidence that evolution of the human genome has involved selective pressure exerted by microbial pathogens. Perhaps one of the best characterized examples of this natural selection process is historical exposure to falciparum malaria and its' association with the β-globin SNP underlying the haemoglobin S sickle cell trait. The frequency of this mutant allele (and other β-globin variants such as haemoglobin C) is greater than 25% in populations in Sub-Saharan Africa where it has been observed to mediate a strong protective effect against severe malaria . Data reported here provide information relevant to the growing interest in understanding how innate immunity may contribute to malaria susceptibility. Information on the genetics of innate immunity should help define the basis of individual and population variation in susceptibility to malaria pathogenesis and may facilitate efforts to develop vaccines, vaccine adjuvants, and treatments to fight this infectious disease. This study focused on TLR2, TLR4, TLR9 and MAL because these genes have been implicated in human malaria pathogenesis. Evidence for this includes in vitro experiments in which engagement of the immune receptor by putative malaria toxins and activation of downstream signaling pathways lead to production of pro-inflammatory cytokines [5, 27, 28], and from case-control studies in which the frequencies of selected polymorphisms among individuals with severe malaria illness are compared with those of ethnically and age-matched residents with asymptomatic malaria [4, 6]. The results presented here suggest that none of the TLR or MAL polymorphisms examined have been under strong selective pressure by malaria. Although the protective haemoglobin S and G6PD polymorphisms are significantly more common in Kenyan residents of the malaria holoendemic area compared to residents of the nearby episodic low transmission area , statistically significant differences in mutant allele frequencies of the TLR or MAL polymorphisms were not detected. A notable finding in the Papua New Guinea population is concerned with the MAL SNP that confers a Ser→Leu amino acid change. The mutation abrogates downstream signaling following ligand engagement of TLR2 and TLR4. The frequency of the mutant allele in the Papua New Guinea population was high (14.9%, see Table 1) compared to the other populations. Moreover, identification of homozygous individuals for the mutant Leu allele (11 of 254 individuals, see Table 2) is of potential interest since previous studies have suggested that heterozygosity affords protection against not only malaria but also bacterial infections. Homozygosity for this allele has not been observed in African populations (e.g. Khor, et al  reported no homozygous individuals among the 4902 West and East Africans genotyped in their study.) Third, all of the polymorphisms in malaria endemic populations studied here were in Hardy-Weinberg equilibrium, suggesting that selective pressure by malaria (or other population-wide effects such as bacterial infection, starvation, population size, non-random mating, etc), has not affected the frequency and distribution of the allele. Additionally, these alleles followed the Neutral Theory as determined by a p-value < 0.05 for the Ewens-Watterson test of homozygosity. For the polymorphisms examined in these study populations, the frequency of observed homozygotes was not significantly different than the homozygote frequency expected under the Neutral Theory. This suggests that genetic drift rather than natural selection, by malaria or any other agent, has been more significant in determining these allele frequencies. The lack of difference in the frequency of these polymorphisms among populations with varying levels of malaria endemicity may be because these innate immune pathways truly do not alter susceptibility to severe malaria. However, it is important to recognize alternative explanations. The number of individuals sampled may be insufficient to detect statistically small but biologically meaningful differences. Whereas MAL Ser180Leu and the TLR4 SNPs in other populations have respectively, been associated with protection and susceptibility to malaria, these associations may not exist in the Kenyan or Papua New Guinean populations examined here. For example, HLA-B*5301 and HLA-DRB1*1302 were associated with resistance to severe malaria in Gambia , whereas this association was not found in Kenya . TNF and ICAM-1 polymorphisms and their association with malaria susceptibility has also been inconsistent across various populations (reviewed in ). Other counter-selective forces in these populations also may be acting to limit the spread of the polymorphisms in the genes studied here. Polymorphisms that are protective against malaria may increase the risk of non-malarial infectious diseases. For example, recently it was demonstrated that Duffy blood group-negativity, which confers complete protection from blood stage P. vivax in Africans , increases the risk of HIV infection in African Americans and may also contribute to the burden of HIV infection in Africa . Because TLRs and their downstream adaptor proteins are critical in the responses to different pathogens, it is likely that similarly complex selective pressures act on these genes. This study is the first to describe the TLR 2 5' untranslated polymorphisms in Kenyans and Papua New Guineans from malaria endemic areas. These polymorphisms presumably affect transcription and/or translation. The Δ22 polymorphism is located in the first untranslated exon of TLR2, approximately 60 bp downstream of an NF-kB site critical for chromatin remodeling and binding of transcription factors . The in vitro phenotypes of Δ22 and GTn need to be investigated more thoroughly to determine their effect on mRNA transcription and/or translation. Although these polymorphisms have not been studied in malaria case-control studies, TLR2 is potentially involved in the pathogenesis of malaria because of its putative role as a receptor for P. falciparum-derived GPI . Future studies with larger sample sizes, additional SNPs, and other genetic loci are needed to determine more completely whether falciparum malaria has been involved in natural selection of genes that regulate innate immunity in humans. Advances in analytic and molecular tools such as tagged SNPs, such as those now available in the International HapMap project, also make it possible to identify signatures of natural selection in these and other genetic loci without a priori knowledge of their biologic function and contribution to malaria pathogenesis . The goal of this study was to identify TLR and TLR adaptor polymorphisms under selective pressure by malaria. The data suggest that history of malaria exposure of the two Kenyan populations has not been involved in selection of TLR2, 4, and 9 or MAL polymorphisms. Case-control studies comparing the frequencies of these polymorphisms among individuals with severe malaria with those with asymptomatic malaria infection need to be conducted to define more completely the potential role of these innate immune genes in human malaria pathogenesis. We thank Rajeev Mehlotra and Amy Hise for critical reading and discussion of the manuscript. We thank Daniel Tisch for his help with the Papua New Guinea database. Susan Wherley helped genotype some of the North American samples. JG performed and analyzed genotyping assays and drafted manuscript. JK conceived of the study, participated in its design and helped draft the manuscript. PZ participated in the design of the genotyping strategy and assisted in the analysis of the genotyping data. AM, JV, and MB were involved in collection of samples and the design of population-based field studies and helped write the manuscript.